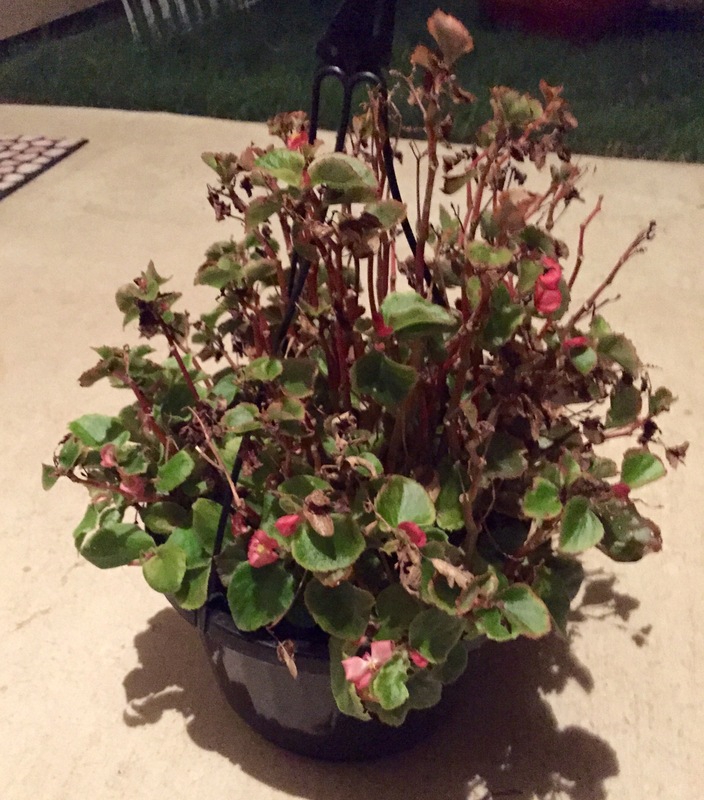 A month ago, I had given up on this begonia. I’m not sure if I had neglected it too much or the mama bird that laid her eggs and then nurtured her babies in it had taken too big a toll, but I was sure it was a goner. All the leaves had turned brown and dried up, as did the pretty pink flowers. But then something happened. I put it aside in my backyard, intending to add it to a pile of other past-their-prime plants. I ignored it for a few weeks. Then about a week ago, I noticed a new growth of green leaves on it. I gave it a good shower and it kept growing. Now there are green leaves almost all the way up — and pink flowers have appeared. Glad I didn’t toss it in the garbage or scrap pile. It’s a nice addition — again — to the back patio. Note: Thanks to fellow blogger Shannon of DirtNKids for nicely mentioning that this is a begonia — not an azalea as I originally posted. Not sure where my head was when I wrote that! This entry was posted in Gardening and tagged azalea on August 7, 2015 by Julie Riebe. Begonia? Yes, these guys are tough. Hard to kill which is why they’re a favorite landscaping plant in the heat of Texas summer. Well jeez, yes it’s a begonia, not an azalea. My bad.